When it comes to sunglasses, there are two rules that I've always lived by. One, unless I'm staring directly into the sun, I always remove my sunglasses when I'm talking to someone. I find it awkward and strange to be carrying on a conversation with a person and not be able to see their eyes. How do I know where to look? Two, for me it's all about the cheaper the better. I'm not someone who is willing to spend any considerable amount of money on a pair of sunglasses that are just going to be tossed around in my car, shoved into my purse or buried under papers on my kitchen counter. As long as they keep the sun out of my eyes and they look good, that's all that I need. Therefore, no matter if I'm shopping for black retro sunglasses or trendy aviator sunglasses, the place I know I can always turn to for style and affordability is none other than Sunglass Warehouse. With Sunglass Warehouse's super-fast shipping, the OveRxCast Large Polarized Sunglasses #1398 arrived and made it suddenly possible for me to wear my glasses (which I prefer over my contact lenses) but still shield my eyes from the sun. 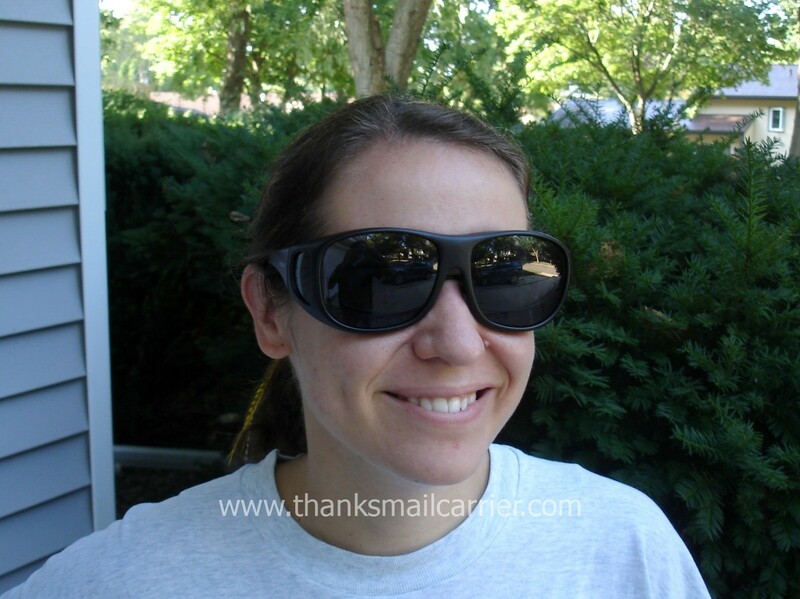 The perfect style for wearing while driving or just outside enjoying the weather, these frames are designed to help isolate your eyes from the elements and provide maximum UV protection - they block 100% of harmful UV rays. Although these aren't as hip and trendy as the aviator sunglasses that I might otherwise wear, I love having the ability to slip them on right over my normal eyeglasses and take away the harsh glare and allow my eyes some relief. Designed to be worn over frames not exceeding 138 mm wide x 50 mm high, I hadn't realized that by choosing the Large size in these sunglasses (they are also available in Medium and Wide) that they would be quite as large as they are. But hey, the oversize look is in right now, right? Even though my husband might tease me a little bit about the size, I've really enjoyed these sunglasses and prefer to keep them in the car for easy access to putting an end to the squinting. As the durable plastic frames surround my prescription glasses on the front and sides, they comfortably rest right on top and only make a slight addition to the weight. 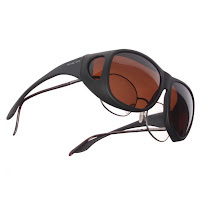 Also available with copper lenses (instead of the smoke color that I chose), the OveRxCast Large Polarized Sunglasses retail for $19.95 and would make a great gift for the glasses-wearing family member or friend in your life that could use help protecting their eyes from the sun in the summer and the glare off of the snow in the winter. With customer service as their top priority, Sunglass Warehouse has provided quality sunglasses at affordable prices to thousands of satisfied customers. I love the way that they manage to capture the designer look without the inflated price tag to go with it. You're able to purchase traditional, classic frames or sleek, celebrity- inspired ones and not feel as though you have to spend a fortune. Even better, to help narrow down their tremendous selection, they have recently included tips such as "choosing sunglasses based on your skin tone" and "choosing sunglasses for your face shape" to help you find the ones that will be perfect for you and your look. With the styles you want and the prices you can afford, it's time to stock up on sunglasses for the remainder of summer and all throughout the fall and beyond. One lucky person will win their choice of sunglasses from Sunglass Warehouse! To enter to win: Visit Sunglass Warehouse, browse their stylish selection and tell me which one you might choose if you win. 1 Extra Entry (per method) if you follow Sunglass Warehouse on Twitter and/or Like them on Facebook. Giveaway will end on September 16th at 11:59pm CST. Do me the favor of leaving an email address or making absolutely sure it is visible in your profile, I have to have a way to contact the winner. The winner will be chosen by random.org and announced here as well as emailed and will have 48 hours to contact me or respond to notification or a new winner will be chosen. This giveaway is open to residents of the U.S. and Canada only. 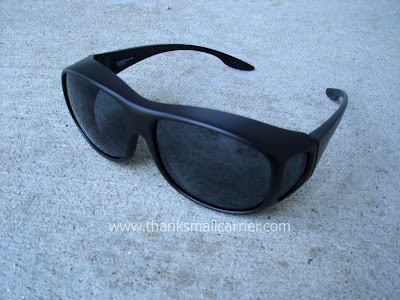 A big thank you to Sunglass Warehouse for providing the OveRxCast Large Polarized Sunglasses for me to review as well as the sunglasses of choice for one lucky giveaway winner. The opinions shared are my own and honest and if you really need to see more, click here to see how I roll. SW 1970 is a sweet style. I actually love the ones you got. I'm the same way and would rather have something just slip over! I follow SW on Twitter! I follow SW on Facebook! SW Celebrity Style 511 is what I believe I would choose. I like the Polarized fashion sunglasses #2712. I might choose the SW Retro Style #1689. I love the SW Cat Eye Style #2149. Since I'm probably going to have to go back to wearing presscription glasses again - I would more than likely choose OveRxCast Medium Polarized Sunglasses #1399. I entered the My Pet Firely from Gemmy giveaway. I'd choose the SW Mirrored Aviator style sunglasses. It would give me that Southern sheriff look. I like the animal print cat eye style glasses. I like the SW Celebrity Style #9978. 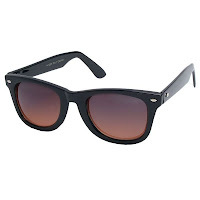 I liked Sunglass Warehouse on FB, plus your page. Hoping I am the lucky winner!